Gosh we had so much fun this morning. We went off to the Owl Creek Produce Auction. You know you’ve been buying too much when the auctioneer has your bidder’s number memorized within the first 30 minutes. Which makes my husband very grateful that the auction barn is a 45 minute drive from the inn and the auctions take place in the mornings, so usually I’m too busy at the inn to get there very often. This auction is a way for local farmers and producers to get their fresh produce and plants into the hands of restaurants, stores and the public. It’s located just a few miles off I-71, mid-way between Columbus and Cleveland, so it’s convenient for buyers to pull up, buy what they want and get back on the highway quickly. The goods on consignment are whatever is in season, and range from large lots grown by bigger farms, right down to one cabbage grown by an Amish family. The auctioneer usually starts off selling the bigger lots first. There were plenty of yellow squash and zucchinis today. One seller had something called “eight ball zucchini” Perfectly round softball size zucchinis. I thought they’d be interesting for dinners at the inn, perhaps halved and stuffed, but they were being sold in 4 peck lots and I just couldn’t use that many. I was disappointed that local strawberries were more expensive than usual. Flats of 8 quarts were selling for $32. At that price we won’t be making strawberry jam this year. I guess the weather has been too dry to get a good crop. I did manage to get some bargains though. 5 huge tomato plants for $1 each. I really only wanted 2 but they came in a lot of 5, so I guess I’ll share with a friend or two. 8 herb plants in a flat for 50 cents. Huge bags of broccoli for a quarter. 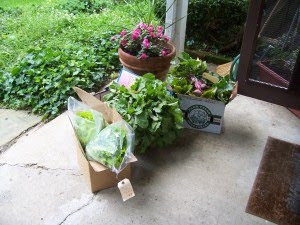 Big bags of looseleaf lettuce for $1 each. 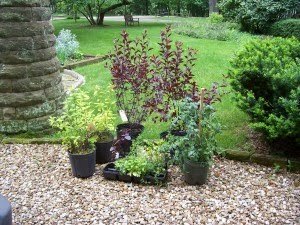 The best buy of all was two beautiful 5 foot tall Purple Sand Cherry bushes to plant by the inn gazebo. Just $6 each. I bet I’d have paid at least $40 at the nursery for a plant this size. The auction takes place May to October, Mondays at 11 a.m., Wednesdays at 10 a.m. and Fridays at 9 a.m.. It’s on Waterford Road, near Fredericktown. Great free entertainment if you can resist bidding! Local farmers market offers local produce, fresh fruits, baked goods, oh my!